The Department of City Planning (DCP) rejected a request from elected officials for a Uniform Land Use Review Procedure (ULURP) for the Two Bridges neighborhood on Manhattan’s lower east side. Previously, The Architect’s Newspaper reported on the profusion of skyscrapers set to blossom on the waterfront. L+M Development and the CIM Group (Two Bridges Associates) are planning a residential complex near JDS Development Group’s SHoP-designed 77-story tower, while Starrett Corporation may build a riverside 60-story tower. Rounding out the developments is Extell’s One Manhattan West, an 80-story luxury condo that will be open to residents in three years. 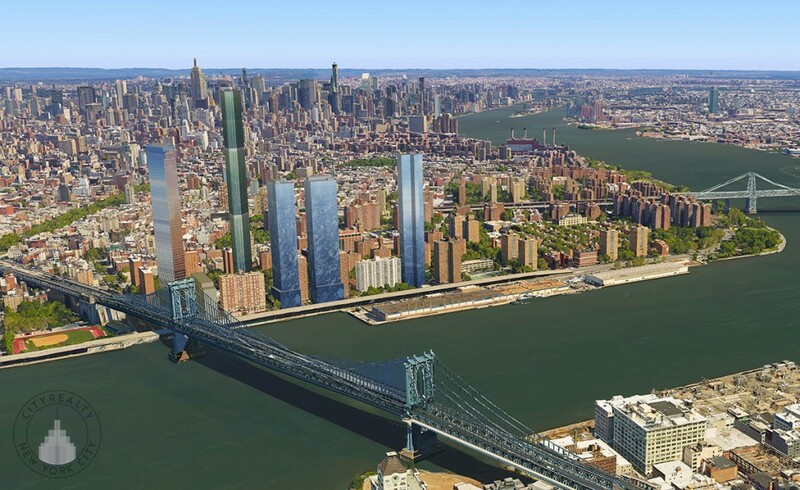 In a letter to City Planning Commission chair Carl Weisbrod, city council member Margaret Chin asked for reform of the ULURP process for three planned towers along the East River. The ULURP would have sent developers’ plans back to the neighborhood’s community board, borough president, and ultimately the city council for review. The developers have agreed to a “coordinated review” of the proposals, Weisbrod continued, and the city will mandate an Environmental Impact Statement with the applications. We are disappointed by the decision not to treat this as a major modification to the Large Scale plan, but are encouraged by the requirement of an Environmental Impact Statement that will address the cumulative impact of these planned developments in the Two Bridges neighborhood. We look forward to working with City Planning, other elected officials, and the community to mitigate the impacts of development, and to make sure the community’s voices are heard. Weisbrod’s full memo and Chin’s response can be found here.